Our second dining experience of the day was quite a drive away in Kathikas, at Imogen’s Inn Taverna. Imogen’s was a new discovery of J’s parents, and after lunch and dinner ‘experimental’ visits they took us there. As mentioned, it is quite a drive away from Paphos town, but the experience was worth the half-hour drive. The restaurant itself is set back from the street and the only visible indicator is the a-board sign. There is a passage way with small tables set, which then opens out, into a courtyard surrounded by trees and bushes, with the main building directly in front. It is a lovely setting, warm, welcoming and pretty. We ordered drinks, Keo (local lager/beer) for my husband, a large carafe of house red wine for my in-laws, and a half carafe of house white for me. Our beverages were prompt in arriving as we perused our menus. The menu is broad, with many options from local Greek Cypriot, Mediterranean and standard British fare. As the menu is so broad, it took two visits from the staff for us all to decide on our meals for the evening. We opted for starters and main meals, rather than dessert. Instead, we planned to have coffee and a brandy to end the meal. We all opted for local starters, J and I both chose the halloumi. We love halloumi done properly; however, I have not yet mastered the knack. It was warm and tender, a slight crisp to the outside, soft but not yet molten on the inside. Perfect, not in the slightest bit rubbery. It was also the perfect size for an appetiser, enough to waken the taste buds but not enough to overwhelm the appetite. My mother-in-law opted for a stuffed and marinated aubergine starter, which was rather large. A whole, if slightly smaller, aubergine stuffed with tomatoes and onions, in a spicy tomato sauce. She enjoyed it and I’ll be honest and admit it sounded nice, but I have an aversion to aubergine. My father-in-law opted for kolokítokeftedes, a local dish of fried courgette and feta cheese in (meatball-sized) balls, which he thoroughly enjoyed. When we ordered our meals we ordered everything together (apart from the coffee and liqueurs) and when we had chosen our main dishes she gave us the option of accompaniments; chips, rice or salad, or a mixture of any two. I am continually irritated by the serving of chips with almost everything; however, I did like the option of mixing two together. While I imagine it is unusual to serve chips and rice together, it is nice that salad can the only accompaniment, or in tandem with chips or rice. M-in-law and I both ordered the pork stroganoff special, with rice. F-in-law chose the lamb chops and J opted for the sirloin steak, they both decided on chips. The stroganoff was delicious. The pork was tender and retained its juices, and the sauce was flavourful and creamy. Even the rice was cooked to perfection with a subtle flavour I couldn’t quite place. I know that F-in-law enjoyed his lamb chops, although he couldn’t quite finish all of it. He blames his reduced appetite on his advancing years, supposedly. However he enjoyed it. The lamb was well cooked, in that it seemed to slide off the bone, wasn’t greasy and kept its moisture. It can be a failing in some restaurants that the lamb can tend toward retaining a lot of grease. It was not the case here at all. J was particularly impressed with his steak meal. His ample sirloin steak, served with a large, fried mushroom, two halves of grilled tomato and of course, the chips. He is very fussy about his steak and likes it well done, with only the barest speck of pinkish-brown in the very centre. He proclaimed it “perfect” and I have to agree, as he shared a little with me. It was cooked to perfection and tasted wonderful. Even though I prefer steak cooked medium rare, it was still beautifully cooked and flavoursome. With meal the meal finished, I’ll talk a little about the wine. It is a practise I appreciate that the smaller restaurants, in the country, use their local vineyards and wineries to populate their wine lists. It almost guarantees a good house wine (the wineries want people to find them and like their wines so they are unlikely to provide a substandard example), and the restaurants are supporting their neighbours. The ‘in-laws’ opted for a red wine to accompany their meal and I chose the white. Usually, I am a red wine drinker, but as the weather has been so hot you can’t always guarantee that they will serve a red at a low enough temperature, it can be too warm or over chilled. This was not the case, but I didn’t know that at the time of ordering. However, I am very glad that I chose the white. I have added another white to my list of preferred wines. We already have a good list of preferred reds, but we are short on white wine recommendations for guests. At the end of the meal, F-in-law requested coffee and brandy for the four of us. I love to finish a meal with coffee, it aids the digestions and allows for a letting a meal settle before getting up and moving around. As we had opted for basic coffee, we had Nescafe, hot water, sugar and milk brought to the table, so we could make to our own taste. I appreciated the large cup (mug), as only a caffeine addict can. However, more than one Nescafe sachet is required to make a decent cup of coffee. Either smaller cups or multiple sachets are required for a nice strong coffee. My only niggle, and it didn’t detract from the delicious meal, in a wonderful setting. 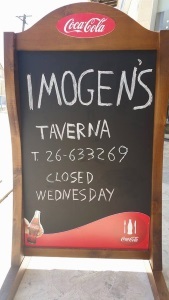 I would definitely suggest a visit to Imogen’s for anyone visiting the Paphos area. This entry was posted in Articles and tagged good food, Paphos Restaurants by Mamie. Bookmark the permalink.